This photograph shows the Medicine Lodge posse from Medicine Lodge, Kansas. 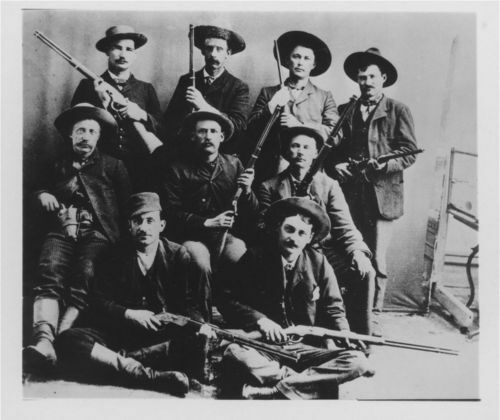 This group of men were responsible for capturing marshal Henry Newton Brown of Caldwell, Kansas, and the would be robbers of the Medicine Valley Bank. The members are identified from the top row: Tom Doran, Barney O' Connor, Alex McKinney, Vernon Lytle. Middle row: Lee Bradley, Roland Clark, Wayne McKinney. Front row: George Friedly, and John Fleming.